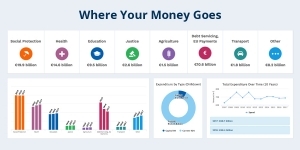 The whereyourmoneygoes.gov.ie website is a graphical, easy-to-use tool. It will allow users to quickly drill into the various sectors that make up government expenditure. It includes dedicated summaries, interactive charts and graphs for the main categories of expenditure such as Social Protection, Health, and Education, and will allow users to look back at expenditure trends of the last decade. This website was built and will be maintained and updated by the Office of the Government Chief Information Officer (OGCIO) a division of the Department of Public Expenditure and Reform.